CAYUSE A GRAND ILLUSION SOLD!! 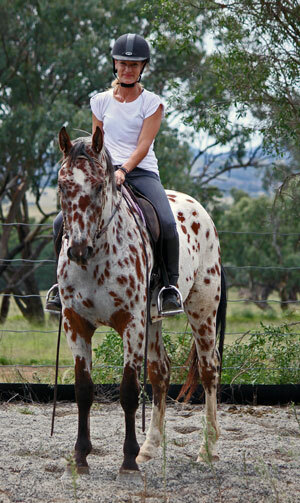 Congratulations to Anita Prowse ,Victoria on purchasing the most awesome spotted sport horse stallion in Australia. May he give you all the enjoyment and super foals like he did for us.Illusion has given us 100% coloured foals this season!well done sweet boy. 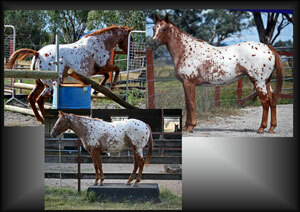 Check out his lovely foals on the 2011 foal page.Lucky I got one awesome filly to keep! He will always be in my heart! Loris Flashpoint Af Lyn(Alf) First Big Outing! 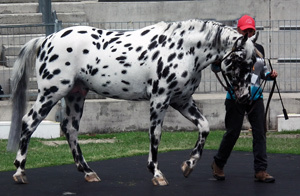 Well we've just returned from a full on 4 days at Equitana in Sydney.Great to Meet lots of keen spotted horse fans who took away pages of Sportaloosa info.Our ambassador this year was 'Alf' and he did us proud for his first time away from home.And a lot was expected of him,4 days in the confinement of Equitana stables(no nice big paddock to run in each day!! )breed displays in th eindoor arena under saddle and only just broken in!! plus lots and lots of patting from visitors from around the world!He passed with flying colours proving once again the awesome temperament and intelligence of the Knabstrupper breed. 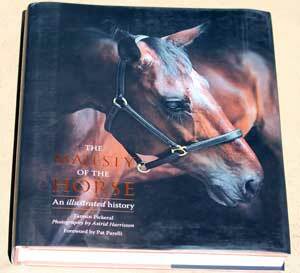 This is the title of an awesome new book,an illustrated history of horse breeds.And quess who stars on pages 67-69??!! !Loris Flashpoint Af Lyn was chosen to represent the Knabstrupper breed...WOW! !The stunning photos taken throughout are by Astrid Harrisson and it is written by Tamsin Pickeral.Good news it is out in all good bookstores now,well worth getting a copy to enjoy. 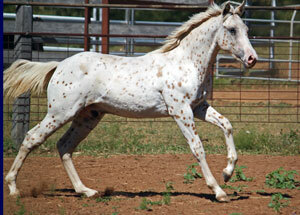 SUPER ATHLETIC CHATTA LENA COLT~! Another Cayuse Off To Victoria!! 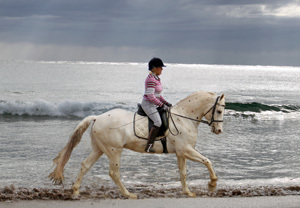 Yvonne Millet,Frankston South,Vic.is keen to start some halter showing with her new fancy gelding Dazzleman.This will be her third 'Cayuse',we wish them lots of fun together. Jesse Hopes He Makes The Big Time! 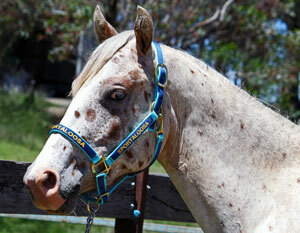 Jesse McGrand,a leopard gelding by Cayuse A Grand Illusion, seen here acting as a model for the Sportaloosa Halters has found a new home at Mt.White with Heath Harris.So we all hope he continues his education and qualifies for the Liberty team. 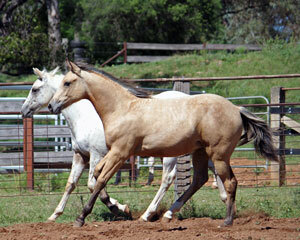 Congratulations to Ken Sturt,Maitland NSW for choosing the prettiest buckskin filly Cayuse Chat Me Up.She will look lovely in the showring and hopefully be a classy performer under saddle too. 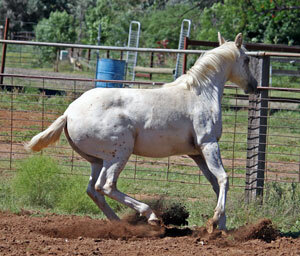 Emma Hughes of Pindi Pindi Qld. 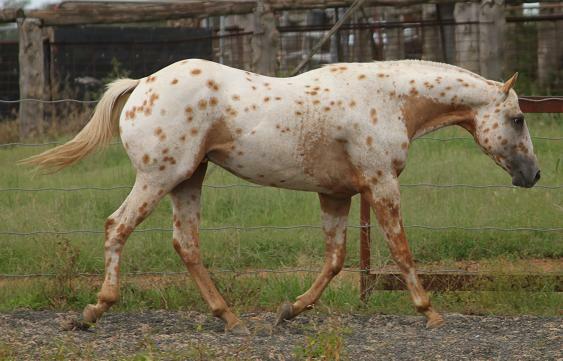 loves the spotted horses and she loves all the working events,stockwork and trail riding to, so the smart filly Cayuse Dun With The Chat will certainly fit the bill with her athletic ability and smart outlook on life! Robert Thompsons dream has come true and he can't wait to start training this flashy gold leopard colt Cayuse Ned Pepper,in the meantime he'll be strutting his stuff around some NSW shows. Was sad to see the beautiful big Knabstrupper gelding,Cayuse Edward X leave Club Cayuse,but know he's going to a lovely home with Kellie Avison-King.Hope to see them one day in the jumping shows. 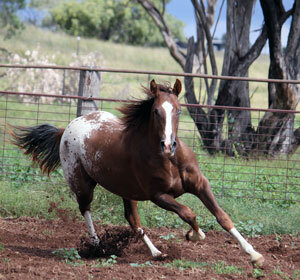 This smart 2 year old is going to be an exciting project for Robyn Arney,Maraylya NSW to train for an all round saddle horse.She also chose the lovely foal Peace Talk as another future dressage horse.He'll be staying to grow up at Club Cayuse till he's 2 and ready to embark on his ridden career.All the best.